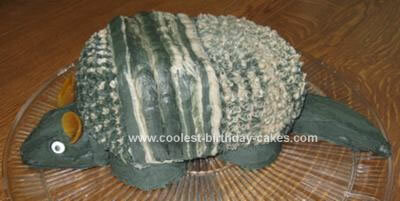 My Grandson has always talked about an Armadillo Cake. His other Grandpa and him have gone back and forth about getting an armadillo cake. For his Grandpa’s birthday they had the bakery add a little armadillo in the corner. Grandma Kathy said it looked like a mouse. His 9th birthday was coming up on April 29th, so I ask him what kind of cake he wanted. He said “armadillo” in 3D. I happen to find this site, and got some great ideas. I thought it would have to be Red Velvet cake to make it authentic, which I found a mix at the local grocery store. I baked 2 mixes in a large stainless steel bowl with sort of a rounded bottom. I also baked 4 cupcakes in small coffee cups to use for the feet. I froze the cake to make it easier to handle. I carved off two sides to make it sort of oval shaped and cut the top of the cake at an angle. So when it was turned over it would be higher in the front. I wasn’t sure what I was going to do for the head and the tail yet, but hoped the cake I cut off would some how work. Thank goodness it did. I carved one piece for the tail and the other for the head. I then cut a cardboard cake circle into the same shape as the body of the armadillo. I set the body on the cardboard and continued to cut the cake to shape the body of the armadillo. I used a butter cream frosting and added a little cocoa to make it light brown. I put half of the frosting aside and added more cocoa to the rest to make dark brown then added black coloring to make it darker (but it ended up looking dark gray with a slight greenish hue after I was done frosting the cake). I frosted the cupcake feet first, placing them in position on the tray. Then I set the cardboard with the body on top of them and added the head and tail after covering them with frosting. The body is frosted using a star tip. I filled the decorating bag with half tan on one side and dark brown on the other. The stars should have come out two-toned, one color on each side. I took the tip off and used the coupler as the tip and made the flat ridges around the center of the body, again in the two-tone coloring. A small marshmallow cut in half made the eyes with a dot of the dark frosting for the center. The ears were made of a dried apricot cut in half. Grandma didn’t have any dried prunes in the house or they may have made a better match in color.